You’ll feel like you’re flying, at the top of Blackett’s Ridge Hiking Trail! This strenuous, rocky hike climbs to a thin, sky-high ridge. 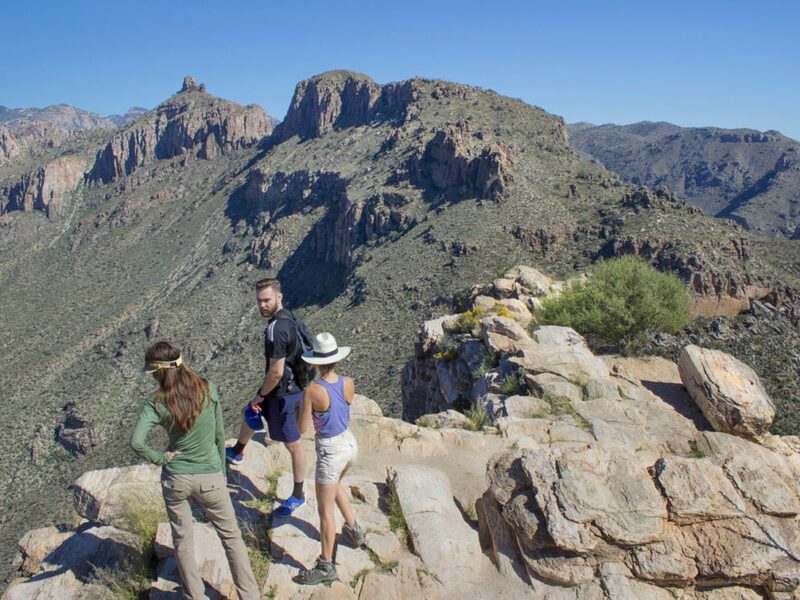 From the peak, soaring views over Sabino and Bear Canyons, and the eastern Santa Catalinas, spread out thousands of feet below. 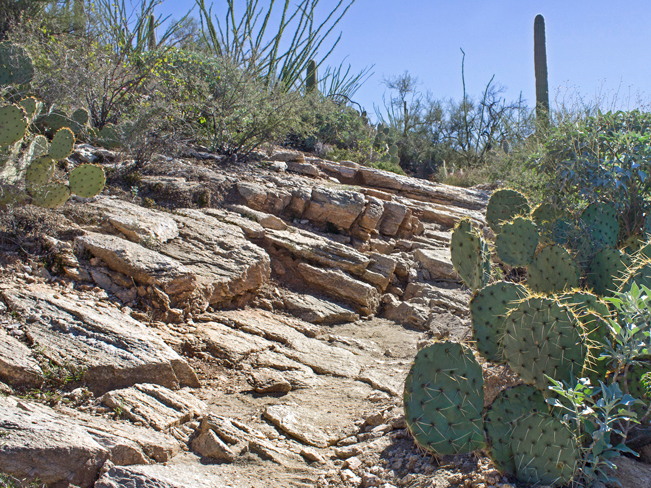 Blackett’s Ridge Hiking Trail is one of the most difficult and rewarding trails in Tucson’s Sabino Canyon Recreation Area. 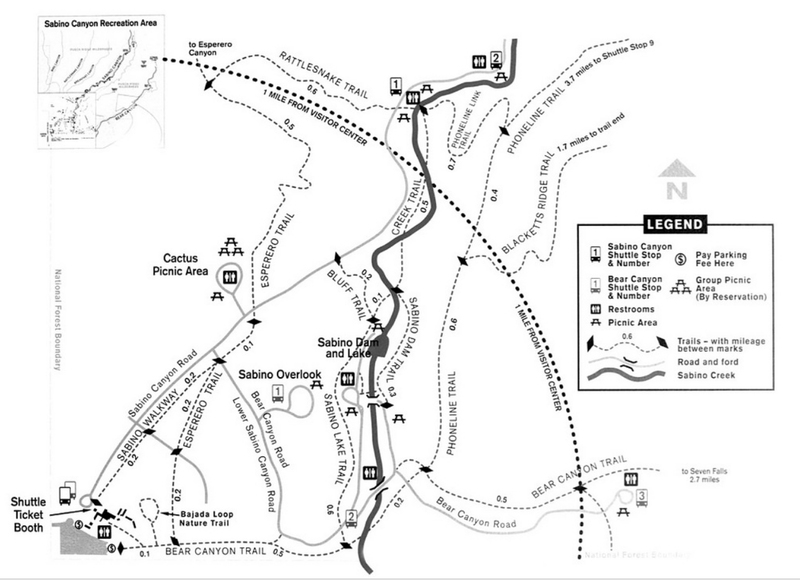 To reach the trailhead, first take easy Bear Canyon Trail from the Visitors Center towards Seven Falls, for 0.8-miles. Then turn right onto the Phoneline Hiking Trail. After a half-mile moderate ascent, the Blackett’s Ridge Hiking Trail veers off to the right. From here on out the Blackett’s Ridge Hiking Trail is pretty much a non-stop, heart-pumping ascent on rocky granite slab. The path first switchbacks up the side of the mountain, with the end-goal just visible in the distance. 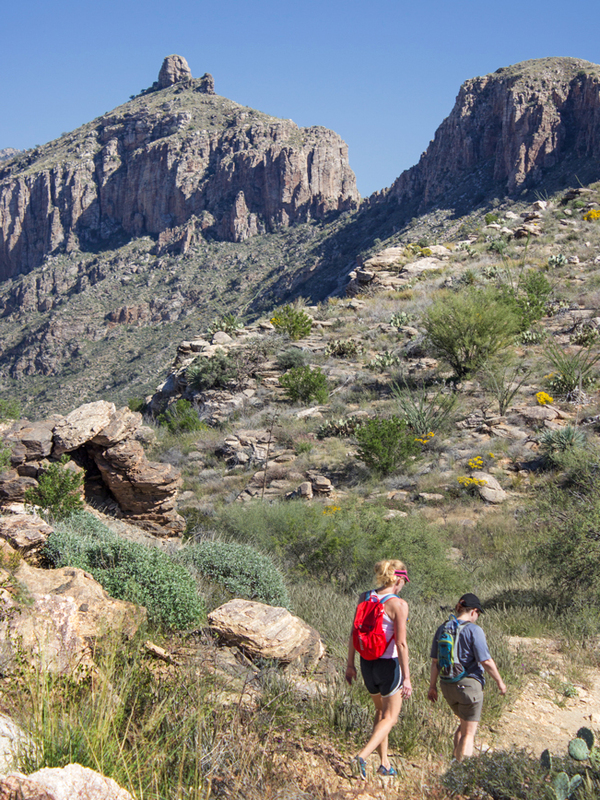 As the trail gains elevation, outstanding views of the beautiful Santa Catalina Mountains fill the horizon. Almost two-miles into the hike, a false peak plays headgames, making you think you’ve arrived. But don’t be fooled! After the trail climbs this rocky slope, there’s still over a mile remaining to Blackett’s Ridge. A short dip offers a welcome breather before the trail makes its final ascent. The final climb is a gnarly hike straight up the ridge. 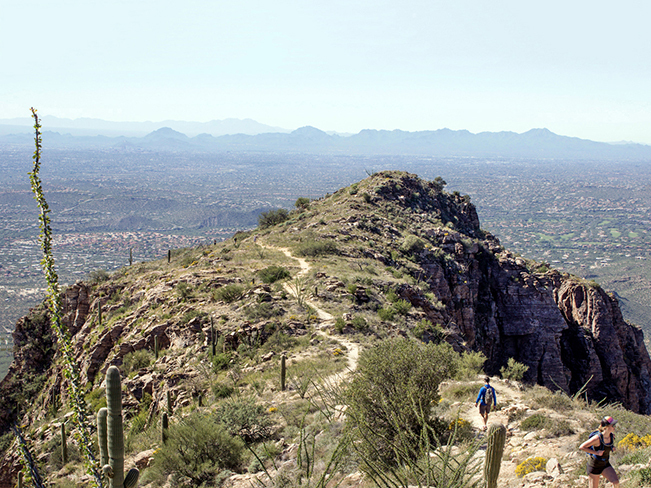 Looking backwards, excellent views of Tucson and the western mountains are a sweet reward. 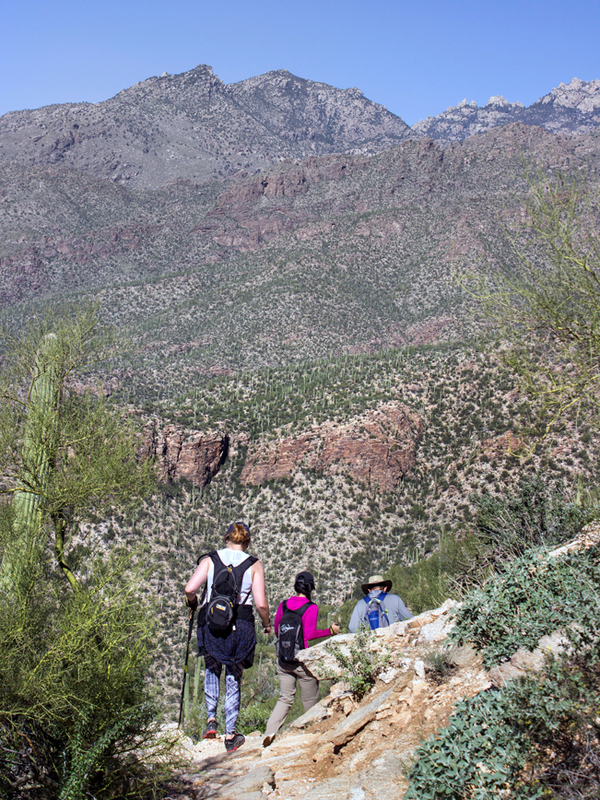 At last, the Blackett’s Ridge Hiking Trail ends, on an increasingly narrow, sky-high ridge. Walk out as far as your confidence (and vertigo) allow. No handrails here! On either side dramatic cliffs drop down towards Sabino and Bear Canyons. 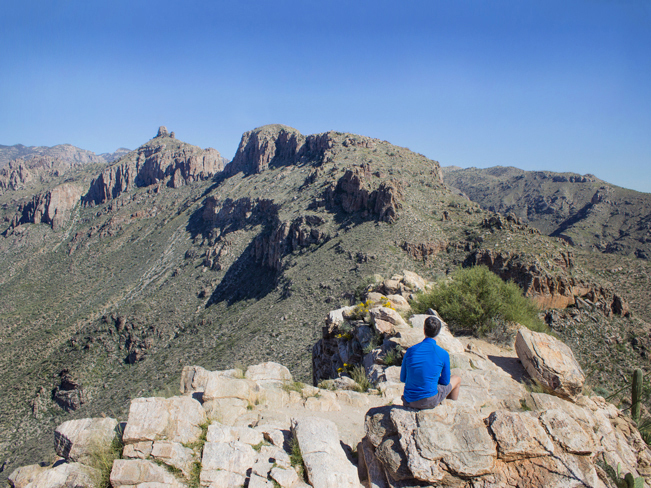 And all around are some of the best views on this side of the Catalinas. Total Nerdery In the 1930s, Don Everett, a teacher at the Southern Arizona School for Boys, named both Blackett’s Ridge and Hutch’s Pool Hiking Trails after a couple of his students. 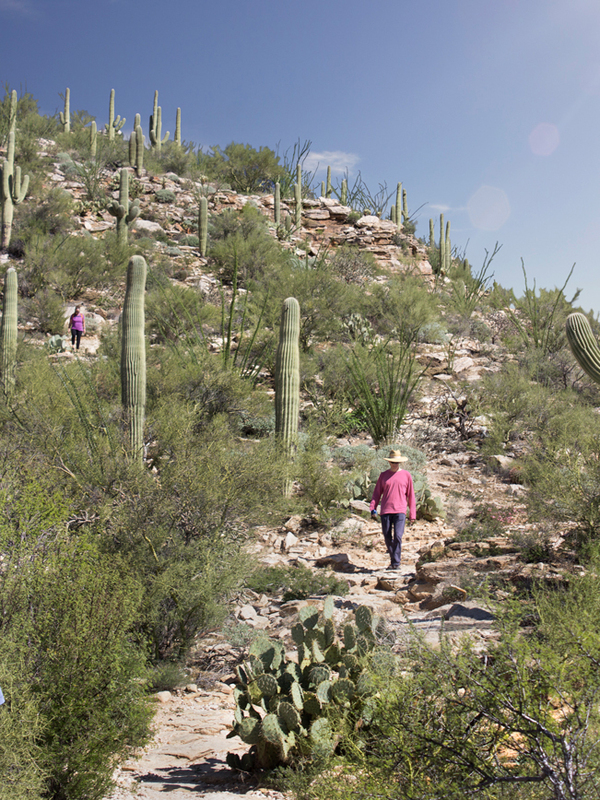 The trail is now a popular workout hike for locals. Resources Click here to download a trail map. Directions: From the intersection of the AZ-10 and Ina Road (in Tucson) head east on Ina Road (which becomes Sunrise Boulevard) and continue 14.8 miles for to North Sabino Canyon Road. 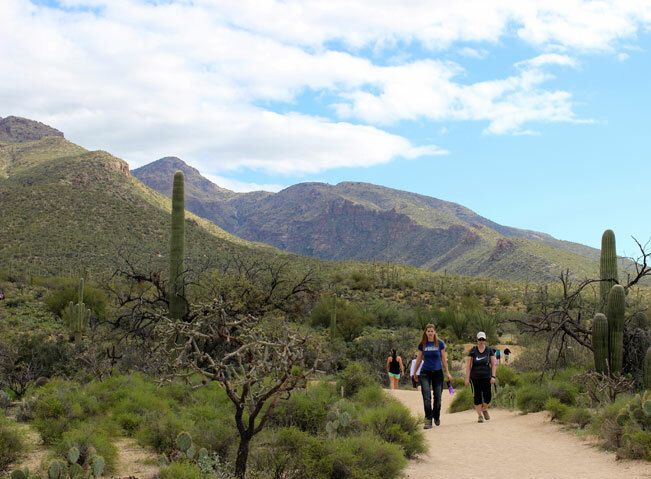 Turn left onto North Sabino Canyon Road and continue 2 miles to the Sabino Canyon Recreation Area visitors center, on the right side of the road. The center is open from 8:30 a.m. to 4 p.m. daily.